Beautyqueenuk | A UK Beauty and Lifestyle Blog: Gift sets you need this Christmas! Gift sets you need this Christmas! If you love a brand and they do a gift set, chances are you will want it or want to buy it for someone who you also want to love it. As well as stocking fillers, there is sometimes gift sets which make buying that gift all the more easier and here are some you definitely need. Vintage Cosmetics Company Girls Night In Tin - I am a fan of this cute and kitsch brand. I love that everything is pink and floral and just so very me. This gift tin is described as being the answer to all your pampering needs, this cute love heart tin has everything you need for a pamper session. Inside you will find Dolly Bow Make-Up Headband, Floral Slanted Tweezers, 4 Way Nail Buffer, Pink Toe Separators, Floral Nail Scissors and Fantail Brush. Priced at just £27.50 from John Lewis, cute and kitsch it definitely is. Omorovicza The Miracle Facial Set. If there is one brand which is going to capture your attention, it is Omorovicza, or Oh - more - o - veet - za as the kind lady at the Liberty counter taught me how to say. Inspired by tradition, guided by nature and spearheading the concept of Mineral Cosmetology, the Omorovicza skincare range has a rich, romantic heritage. It was founded by a young couple, Stephen and Margaret de Heinrich de Omorovicza, who met in Budapest. This spoiling set comprises a trio of sweet-smelling products to tone, refresh, hydrate and nourish the skin: the Queen of Hungary Mist (30ml), the Illuminating Moisturiser (30ml) and the Miracle Facial Oil (30ml). I am already obsessed with both the mist and the oil and really want to get my hands on the Ultramoor Mud Mask. Priced at £80 which is a saving of £60, this is a great introduction to a beautiful brand. Michael Buble By Invitation Gift Set. I hadnt expected to like this fragrance at all (reviewed here) but I did and much more so than I had expected. By Invitation is by description a crisp oriental floral scent which has notes of Bergamot, Jasmine, Peony, Sandalwood Musks and Vanilla Praline which come together to create a scent which lingers, lasts and is displayed in a stunning bottle which is suspended in a golden bracelet making it stand right out amongst its peers. The gift set is also really quite special with a 100ml fragrance and 150ml body lotion at £55 it isn't going to break the bank. Blank Canvas is a brand that might not have caught your attention yet but it should. Right now you can build and customise your very own box, whether for you or a friend. Inside my box are two palettes and two brushes. The Master Series Palette One which I reviewed here, The Pippa Palette which Blank Canvas Cosmetics collaborated with Pippa O'Connor Ormond (a Fashion, Beauty and Lifestyle blogger from Ireland) to create the gorgeous Pippa palettewhich holds six eyeshadows, a highlighter, blush and bronzer. The F20 is a Buffer Brush and it is ideal for applying liquid, cream or powder products. The bristles are incredibly soft on the skin and with a hot pink handle, what's not to love. The E32 is a Tapered Crease Blender and is great for eyeshadow application and blending with both cream and powder products. Tigi is brand I use more for their styling products than the shampoo and conditoner, so these two kits are pretty good. The first one is called Bed Head Bigged Up Volumiser and it features Superstar 'Queen for a Day' which is a body-boosting spray and Oh Bee Hive! which is a dry shampoo and together they work in tandem to create luscious locks. I absolutely love the Christmas themed gift box that it is presented in. This set is currently on offer with LookFantastic for just £13.25. The second kit is TIGI's Catwalk Haute Volumiser; a kit that works to volumise, lift and hold hair in place, leaving you party-ready. With Root Boost Spray which takes care of those limp locks which lifts hair from the root for added body and bounce and Session Series Hairspray which delivers strong yet flexible hold. Again, it is presented in a festive gift box. Worth £31 this set is also available on Lookfantastic for just £13.95 here. Liz Earle Botanist Cabinet - If you read my blog regularly then you will know I have this already but it is just such amazing value for money you need to grab it quick. The Botanist Cabinet features 8 drawers which each contain a Liz Earle product and you can expect to find a full sized Cleanse and Polish of course. At just £30, reduced from £60 it would make a fantastic gift for yourself, your mum, your best friend, your beauty blogger pal or even just because. Find it here exclusive to Boots. Benefit Defined and Refined Brows comes in this really cute and handy tin. 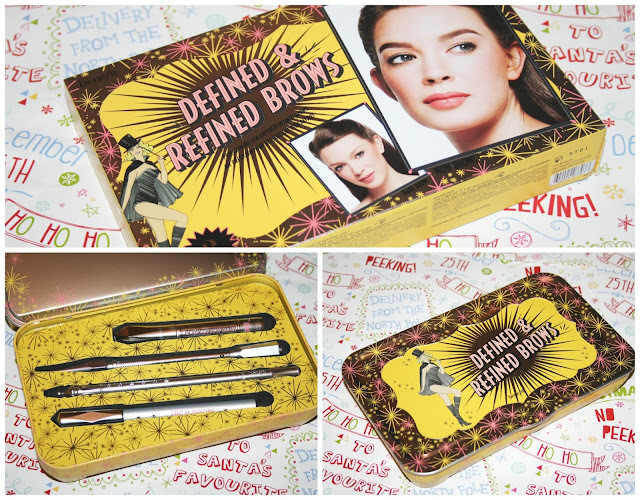 Benefit known for their Brows have these fantastic kits and this one contains Benefit BROWVO! conditioning primer 1.0 ml, Benefit precisely my brow pencil 0.08g and Benefit high brow pencil 2.8 g and custom mapping tool to help you create the ideal brow shape for your face. Alpha-H Liquid Laser without the downtime - If you love Alpha-H Liquid Gold but haven't strayed too far away and discovered other products from the brand then this kit is one to look at. Designed to be an anti-ageing kit, this trio features Liquid Laser Cleansing Oil, Liquid Laser Concentrate and Liquid Laser Super Anti-Ageing Balm. Together, the Liquid Laser Collection has been specifically designed to target the effects of intrinsic ageing, helping to soften the appearance of fine lines, and improve skin texture, tone and moisture content. You'll find this set on QVC for £47. Dermalogica Skin Brightening Duo is housed in a cute little christmas box featuring two products inside to give you that eliminate dullness, purify skin and unveil a natural luminosity. The Daily Microfoliant® is perhaps one of the most known products from Dermalogica and this unique Rice-based enzyme powder microfoliates dulling debris and instantly leaves skin noticeably smoother and brighter. The second product is the precleanse which is a lightweight Olive and Apricot Kernel-based cleansing oil, which gently liquefies sebum and oil-based debris from the skin’s surface, melts away makeup and leaves your skin feelng incredible soft and smooth to the touch. Priced around £53 with LookFantastic this has a huge saving of over £20. L'Occitane have the most amazing Christmas gifts this year and they have something for every budget. Whether you want a huge hamper packed full of gifts, a box of your favourite products or a travel size tin, there will be something for you. The Arlésienne Travel Collection which comes packaged inside this beautiful tin is more than worth its £20 price. Inside you will find three products which are all scented with the Arlesienne scent and it is one I absolutely adore - A 50g Arlésienne Scented Soap, a 12ml Arlésienne Lip Balm and a 30ml Arlésienne Hand Cream. Moving on to makeup with Sleek and this is a brand I absolutely love. The makeup kits are just amazing value for money and I have Secretly Spellbound Glitz & Glam gift set which at £28 in Boots should be snapped up. The gift contains seven full sized products from the range which includes - All Night Long i-Divine Palette which features a gorgeous cocktail of rich smokey nudes, sultry beiges, eye-catching golds and shimmering bronzes. Dip It Liquid Eyeliner In Black, Eyebrow Stylist In Medium, Contour Brush, Face Form In Medium, this is a contour kit which houses a highlighter, bronzer and a blusher. The final two items are Twist Up Lip Pencil In Sugared Apple and Lip Vip Lipstick In Nightspot which is a bright vibrant shade of red. Now I think this has been a gift guide that covers every possible need for this time of year and for a range of different budgets and needs, there are some real beauties to uncover and enjoy. Wow I love all these. The Sleek and Dermalogica are my favourites. The Liz Earle gift set is perfect for that person you didn't think you needed a gift for but suddenly you have to provide a present. Wow, haven't you been spoiled rotten! :) I love Liz Earle and the Bedhead set. I am always blown away by the number of gift sets available at this time of year, this is a lovely selection. I do love a good gift set. They always are well presented and have that bot of extra special about them. Wow I love the look of most of these it would great to see some of these under the tree this year. I really want that Liz Earle Botanist cabinet under my tree! All of these are great for last minute gift ideas as well. I immediately spotted Dermalogica and Sleek, but I wouldn't mind any of these beauty gifts! I am a big fan of dermalogica so I would love the skincare duo. Its one of the only products that does not irritate my skin! Loads of ideas there which is handy as I still need to get a few more gift in. The hard part is deciding which to get. We love Benefit tins and sets. My mummy bought some from their Black Friday sale for Christmas! Black canva seems lovely!!! I love sleek too! You've made me want so many now! Tigi products are gorgeous and I love dermalogica too! I had no idea that Michael Buble had his own gift set! I know someone who would love that, thanks for the heads up! I was looking at some gift sets only today and there are some lovely ones around. I love gift sets because they always make wonderful gifts for others! Thanks for the post!